This was a very good book! I actually got it as a gift from my girlfriend last year. Being the thoughtful girl she is, she looked at Tim Ferriss' 4 Hour Work Week (One of my favorite books) and pulled it from the number 1 slot on his "books to read" list. 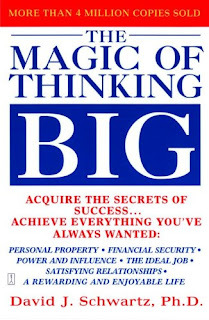 If you are the type of person that wants success, big house, nice car, well-rounded family, great friends and a rewarding life (and I presume most everyone is) then you should read this book. Schwartz introduces the idea that your success relies on controlling your brain power. If you want to be successful then tell yourself that you are successful and your brain, being the amazing creation is it, will snap into action and come up with all the ways you are successful and create ways for you to be more successful. However, if you say to yourself, "I am not successful," your brain will use its power to come up with reasons you are not successful and will introduce more ways you can bring yourself down. The same idea affects ever facet of your life. If you say "I love my friends and family," "I am having a great day," or " I am going to be creative today"- your mind kicks in and puts generates all the mental stimulates that make that statement true. When you are feeling sad, just smile. It may be difficult to do but if you force yourself to smile for about 5 minutes and try to consciously be happy... you will be. Now, it may be difficult to constantly be positive because there are so many distractions and emotions sometimes affect us. You just have to remember what really matters. Schwartz also goes into depth about treating people the right way. He tells a story about a couple consultants that are on their way to a clients business. The whole way there, the consultants talk bad about the client. How he is unintelligent, fat, slow, etc. When they got there, those emotions still had control over their minds. They appeared distant to the client and not very friendly. Later they got a letter that announced the man would like to stop using them for future business. If those same men talked about how great this client was the whole way there, they would have probably kept the client because they would be acting like they like being around him. The same idea goes for your subordinates at work, if you take care of them- then they will take care of you. Find out what they want to do, what ideas they have, and encourage them. This coupled with enthusiasm will push you where ever you want to go. Subordinates often emulate the same behavior as a boss. So while you are working: love your job, show a big smile, help everyone you can, show that you care and everyone around you will soon follow in suit. The power of your mind is an incredible thing. Schwartz finishes his book by quoting Publilius Syrus "A wise man will be master of his mind, A fool will be it's slave. I recommend this book to anyone that wants to do better for themselves in any area of their lives. I hope this opened your mind and if you have any questions on the book don't hesitate to ask me a question. I would be more than happy to help anyone that needs it.